The Convergent Media Collective is proud to host: New Media in the 21st Century. We have two guest speakers who work in new media and do cutting edge works. So please join us for a night of fun. Remember CMC talks are meant to be interactive and we encourage questions and dialog. Description: Time-based, interdisciplinary arts practices with technologies allow an innovative and ever-expanding approach to creative production. As software, hardware, and imaginative amalgamations involving multiple artistic disciplines converge, the resulting promise is beyond anything yet conceived of in the arts. From interactive performances to transformative art installations, the scope and breadth of heretofore unimaginable innovation is upon us. 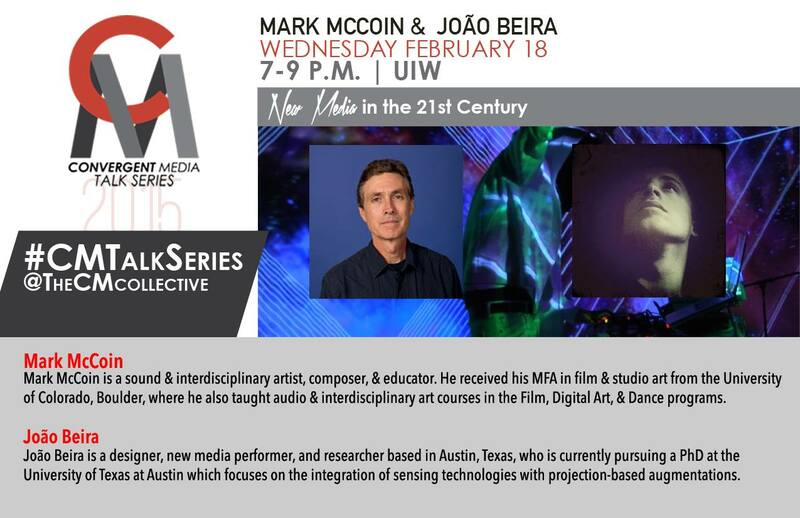 Mark McCoin, head of the New Media art program at UTSA, will present and discuss his approach to interdisciplinary, experimental time-works, along with the pedagogics that result from of his research. Both personal and student works will be presented and analyzed as templates for potential courses of action in the field of multidisciplinary artistic presentation. Bio: Mark McCoin is a sound and interdisciplinary artist, composer, and educator. He received his MFA in film and studio art from the University of Colorado, Boulder, where he also taught audio and interdisciplinary art courses in the Film, Digital Art, and Dance programs. As a musician, he has performed in a host of venues, including Carnegie Hall, Merce Cunningham Studio, the Smithsonian, ruin sites in Peru, and villages in Bali, Indonesia. As a scoring composer he has written works for dance, theater, film, art installation, radio, and for multiple seasons of episodic television. His creative collaborations include works with Michelle Ellsworth, Mark Amerika, Bruce Odland, Dr. Andrew Weil, Joanne Shenandoah, Mary Youngblood, and Max Bernstein. His own site-specific multidisciplinary works and collaborations include “Circadia”, which was performed in Blake’s salvage yard, and “Gifts From Unknown Islands,” which was conceived and performed in the ATLAS Interdisciplinary Theater in Boulder. Mark is currently serving on the executive board of Friends of the Tank, is one half of Outlier, the interdisciplinary piano-harp performance duo, and is an assistant professor in the Art Dept. at the University of Texas, San Antonio. Whether based in performance or installation, the variety of experience reflected to date in his multi-faceted career continues to prompt his explorations down less familiar avenues in teaching, composition, and in the art of presentation. Description: In this presentation I will share my experience working within design, live performance, and technology. Sensor-based design as augmented reality strategies in physical space are becoming evermore relevant in the digital era. Through this talk and presentation I will establish an understanding of 3D video mapping techniques and motion tracking from both a theoretical and practical perspective. Topics will include: concept design, perspective and spatial design, pre-production, map generation, content creation, and live execution. Bio: João Beira is a designer, new media performer, and researcher based in Austin, Texas, who is currently pursuing a PhD at the University of Texas at Austin which focuses on the integration of sensing technologies with projection-based augmentations. Born and raised in Porto, Portugal, he started to vj around 2000, combining motion graphics with interactive design to produce live visuals. He is the founder and creative director of Datagrama, whose work has been displayed at many notable art festivals and gatherings such as Boom Festival, SXSW, Symbiosis, Burning Man, and Sonic Bloom, to name a few. Beira has also been in charge of art direction for 3D video mapping projects for clients such as Vimeo and National Geographic. He has also been involved in artistic collaborations with talented artists such as Quixotic, Vitamotus, Ninja Tune, Sorne, etc. He holds a M.A. in Multimedia Art, and was a lecturer at the ESG University from 2007 to 2010 in Design and Multimedia Production. His creative performance work, design, and research has been rewarded by the Austin Critics Table Awards nomination for the Best Video Design 2012 and 2013. He also won also a four year International Grant for his PhD research in Interactive Design at the University of Texas from FCT (Foundation of Science and Technology), conducting multiple interactive media design workshops, publishing scientific papers and participating in artistic residencies.